The United Nations in Nepal says that it has begun overseeing the storing of weapons held by the army. The process is a key part of a peace deal last year that brought an end to Nepal's decade-long civil war. Under the deal, the army is required to lock up the same number of weapons as the former guerrillas have done. Meanwhile, the Maoists have applied for recognition as a mainstream political party ahead of planned elections later this year. It is one of the final steps they have to take in renouncing their status as rebels and becoming a party. The deputy leader of the Maoists, Baburam Bhattarai, told reporters the party wanted to call itself the Communist Party of Nepal, and had applied for the hammer, sickle and star on the traditional red background to be its official symbol. The UN says its arms monitoring team began registering army weapons from Tuesday afternoon. It said that it hoped that the arms storage process will be completed within the next three to four days. Officials say that the army's weapons are being locked up in an army camp on the outskirts of Kathmandu. 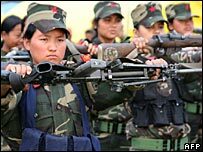 "We have begun storing equal numbers of arms to those of the Maoist army under the monitoring conditions," army spokesman Ramindra Chhetri told the AFP news agency. He said that the weapons would be sealed in 14 UN containers at a barracks in Chhauni and the army will keep the key. He said that the containers will have electronic alarms that will be triggered if anyone tries to remove the weapons. The UN says that the former rebels have so far put about 3,500 guns out of use. They have been locked up in similar metal containers in the seven main camps where thousands of their former fighters are confined under the terms of the peace pact. 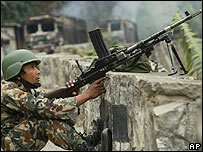 The UN was invited by Nepal's government and the Maoists to register and monitor the weapons held by both sides. The Maoists entered government earlier this month after waging a decade-long bloody "people's war" that killed at least 13,000 people.